The shooting death of Trayvon Martin, the 17-year-old black Florida high school student who was killed by George Zimmerman on February 26, 2012, spurred one of the most widely reported, painful and controversial public conversations on race and social justice in recent memory. The story started as a local news piece, and quickly morphed into a national debate in newspapers and radio stations; on YouTube, Twitter, Facebook, Reddit and other social media channels; on front stoops, in office cubicles, and at kitchen tables; across marches, rallies and demonstrations; and through online petitions and campaigns. These events coalesced and influenced the actions of news organizations, citizens, politicians and thought leaders in a very public way. This offline/online “networked” public discourse was a far cry from the analog (print, radio) news model of the past. Understanding how information and news networks relate and influence one another helps you decide where to take your message, and to thus influence and help set the agenda for public debate. This is where today’s social change organizations will succeed or fail in their efforts to remain relevant and effective agents of change. “The Battle for Trayvon Martin: Mapping a Media Controversy Online and Off-line” study analyzes, piece by piece, each facet of the intersection between the offline and online reactions, advocacy, citizen journalism and organized media coverage of the Trayvon Martin news event, and presents an analysis that takes us to the very epicenter of the intersection between media coverage, online and offline activism on both a personal and grassroots level, and the results through the lens of public discourse. This pioneering February, 2014 study was authored by Erhardt Graeff, Matt Stempeck and Ethan Zuckerman of the MIT Center for Civic Media. The goal of the study is to analyze the evolution of the Trayvon Martin story and to understand the role that activists in how the story played out across offline and online media channels . To the best of my knowledge, the authors are doing something that no one has done before for traditional and digital media (the methodology will give you a headache, in a good way)—they attempt to quantify and measure far beyond the “clicks” on articles that many of us traditionally use to measure engagement and, from that, to glean our influence over the message (I know I’m over simplifying but not by much). Rather, they map the spread and cross-pollination of those ideas across all media (offline and online, traditional and participatory) and make correlations around consumption (who is clicking) and engagement (what they do and share afterwards), tracking it all back to the message (how does all of this effect how analog and digital news outlets cover the issue). It’s a fascinating cycle, and one that any organization interested in shaping public opinion and effecting social change would be better served to learn. This post attempts to translate the findings of the study into takeaways that organizations who focus on social change can use to better understand the correlation between traditional, digital and social media today. First, let’s take a look at one of the most helpful parts of the study—an analysis of the journalism ecosystem of today. To be effective, social change organizations need to understand how to work and communicate in what the study defines as the “ecosystem” of news and information today. I think of this in broader terms—to me it’s more of an information ecosystem. Regardless, it is not the topdown gatekeeper model from back in the day of print news—the managing editor, the reporter, and you—cultivating a personal relationship with a network of journalists to pitch your story. Don’t get me wrong, that world exists. But it has expanded by so much that if you don’t understand where else others are engaging, you’ll be talking to an empty room, albeit a virtual one. The study underscores this by helpfully describing the new world of media as an ecosystem rather than an environment. The distinction may be lost on some of us, but the definition the authors present is clear. So what comprises digital media today? The study emphasizes both professional content (journalists) and amateur content (“citizen journalist” bloggers, for example). Add to this, everyone—those who write 50-word posts on Facebook that get shared, Tweeted and discussed; 140 characters on Twitter, those who post Instagram photos and opinions; the discussions on Reddit, etc.). The authors describe this as “the networked public sphere.” And it’s a big universe with lots of moving parts. If you’re trying to control it, give up (that’s yesterday’s model). If you’re trying to be a smart influencer, read on. The traditional gate-keeper role of the media has been upended by the democratization of information, which gives social change organizations the opportunity to seize and set the agenda of public discourse. What’s cool about this networked public sphere model, and critical for social change organizations to understand, is that it presents unheralded opportunities for these organizations to actually set the agenda for public discourse. As noted above, the traditional gate-keeper role of the media has been upended (to a degree) by the democratization of information. If social change organizations (and more importantly, the individuals who serve as their advocates and ambassadors) choose to engage in digital media (carrying out conversations and sharing information on Twitter, Facebook; pushing cultivating relationships and content with bloggers, etc.,) their message becomes the news, and they get to frame it. Use social media effectively and your message becomes the news—you get to frame the debate. The study references recent media research around the revolution in Egypt (2010), and likens the Trayvon Martin story to that revolution, in terms of how it played out across all media and public dialogue. For example, the authors cite how Twitter’s #egypt hashtag reflected a blend of both personal political expression and a more conventional media push around a central message. To me, the Twitter conversation represents a hybrid of these formerly distant messaging cousins (the individual and the media outlet). Think of it this way: Twitter users pushed out their own message about the revolution framed in a way that expressed their common sentiment, then the more “authoritative” (traditional) media outlets began reporting on that “framed” message, and that particular framing was—in turn—disseminated even further by the readers of those outlets. This is one way in which social media is influencing how even traditional news media are shaping and forming the message behind a story. To trace the path, evolution and influence of the Trayvon Martin story, the authors use Media Cloud and Controversy Mapper (which are, by the way, two tools developed by the authors in conjunction with Harvard’s Berkman Center for Internet and Society.) This is good stuff (case in point: Controversy Mapper’s data visualization on SOPA/PIPA)—imagine being able to analyze not just what the media is covering but how (the message, the interpretation, the framing, the influence) in a rigorous, quantitative way. Well, they did that. Media Cloud collects articles from more than 27,000 mainstream media outlets and blogs, and follows and tracks links mentioned in these sources to explore the coverage even further. Archive.org’s TV News archive helped the authors analyze broadcast TV (they mine transcripts of broadcast TV). On the digital side, the authors also used Google Trends to analyze searches, General Sentiment to track Tweets and hashtags, and the url tracking and shortening tool, bit.ly. First the broader media coverage: social media and professional news outlets. The authors examined the number of times the story was referenced, Tweets and hashtags, TV, Google searches for the subject, location of coverage (e.g., front page indicating editorial prioritization) in national papers, and the public’s online activism (for example, a petition on change.org). The methodology and data collection were far more involved than my crude summary attempt. Because the goal of this post is to translate the study for a more general audience, I don’t do the methodology much justice. It merits a closer read. Why then, didn’t the story die? The difference was the immediate and unrelenting efforts of the Martin family to share their story. By quickly retaining Benjamin Crump, a pro bono civil rights attorney (interestingly, one who, according to the study’s authors, ascribed the failings of a previous probono effort in part to an inadequate media publicity strategy) who brought on a local attorney who, in turn, recruited a pro bono publicist (Ryan Julison). Julison was able to get coverage from two national media outlets, which later snowballed into other national media. According to the study, the story (spurred by the initial limited national coverage) was mentioned on a Howard University listserv. A Howard law grad got involved and launched a Change.org petition. His rationale was the lack of national coverage. He emailed his petition to other students at the university. Yep, email is how this got started. The Huffington Post, Global Grind, a self-described multi-racial news and lifestyle website and activist organizations (ColorOfChange and the Black Youth Project) began covering the story, described by the authors as “early amplifiers.” As a result, the change.org petition began picking up speed (growing from 217 initial signatures on day one—March 8—to over 30,000 signatures five days later (March 13). Something interesting happened on the sixth day after the petition was launched. A change.org employee asked a target group of celebrities whom he thought would be sympathetic to the cause to share the petition with their fans (Mia Farrow, Spike Lee, to name a few). They were interested, and they did share—to the tune of over 80,000 signatures a few days later (a 900% increase in signatures over the course of 3 days, according to the authors of this study). The pattern until March 17 (when the publicist released 911 tapes to the public and the media) was as follows: low-profile, hyperlocal news story; narrow coverage on a national level that spurs a rapid rise of personal and social activism; which yielded high-profile coverage by celebrities and a resulting increase in national coverage. When the probono civil rights attorney (Benjamin Crump) released the 911 call to the media, coverage—particularly in mainstream broadcast radio and TV—predictably mushroomed. The authors of the study specifically point out that the audio nature of the 911 call may have made it more appealing for radio and TV to cover. Reddit’s /r/blackculture subreddit featured the change.org petition and Reverend Al Sharpton’s involvement continued the publicity. By now, civil rights and political leaders all over the country were taking up the charge through political demonstrations and rallies. The authors cite the Million Hoodie March in New York (spearheaded by a digital strategist) as a catalyst for more coverage. Interestingly, the authors point out, larger media didn’t feature the story on their front pages until after the march, positing that the actuality of the march made for an easier story to cover. There’s an interesting pattern here of mainstream media not covering the Martin story until something “real” happens (the authors describe these as “actualities”). Note how radio and TV began covering the story after an audio recording was released, and front page newspaper coverage began after an actual march took place. After Zimmerman was finally taken into custody (another “real” event) six weeks after the shooting, newspaper coverage peaked. And then, of course, the President’s March 23 statement (“If I had a son, he’d look like Trayvon” brought all news coverage to its peak. Who influences how a message is framed by national media outlets? Let me answer that simply—it’s not the media outlets. Nowadays, the spin on a story often takes place outside of national media news sources. Frequently, by the time they report on something, they’re simply capturing what has already happened. So if you want to influence how the a major news outlet writes a story, your message can begin in social and digital media, and with your activists and ambassadors. Let’s look at how the conservative movement was able to influence the debate. The study cites how one notable conservative blogger (Dan Linehan, of the Wagist blog) claimed that Trayvon was a drug dealer. As you would expect, this message was spread and picked up by like-minded right-leaning blogs, and eventually did make its way to mainstream media (the Miami Herald), where it was amplified. So, regardless of the accuracy of the claim (and it was not credible), right-wing bloggers became effective ambassadors to mainstream media. The study’s authors actually cite research that shows that repeating a myth in order to deny its credibility may have the opposite effect. This has strong implications for social change organizations of all stripes—the public debate is often played out as a series of narratives that are alternately supported and refuted by proponents and opponents, respectively. 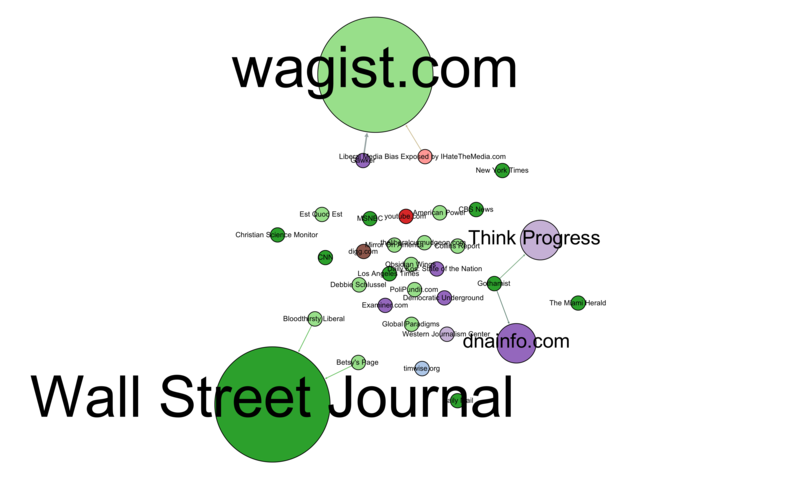 Two graphics show the networks of media that mentioned “marijuana” (figure 8 in the study) and “drug dealer” (figure 9) during this period (notice how prominent the right-wing Wagist bubble is in both graphics.) The large size of the Miami Herald bubble signals high frequency of news mentions of the word “marijuana” in the story; as does the similarly large sized Wall Street Journal bubble (“drug dealer” in the same context). “This suggests a strategy for reframing a story—if an activist is able to gain mainstream coverage for [framing a message a certain way], opponents are likely to respond, [thus] perpetuating a debate that features the desired framing [of the activist]. Remember, these two graphs reflect the prominence of Trayvon Martin and the words “drug dealer” and “marijuana,” an association that his supporters deemed undesirable. All started by a right-leaning blogger, perpetuated by those who countered the claim, and widely covered (eventually by papers ranging from the Wall Street Journal to the New York Times). The authors describe how an organization with a different focus, The Center for Media and Democracy (CMD), a left-leaning organization, injected its concerns about the influence of the American Legislative Exchange Council (ALEC), a conservative lobbying organization that became an outspoken proponent of the “stand your ground laws” that were used in Zimmerman’s defense of the Trayvon Martin shooting) into the debate. The Center for Media and Democracy had launched a campaign against ALEC prior to the shooting but used the controversy to strengthen its campaign. And like-minded progressive organizations formed a cascading effect, as they piggybacked off the Center’s research to pressure corporations to withdraw ALEC funding. Eventually, even Paul Krugman of the New York Times wrote an op-ed (March 25) about Trayvon and the Stand Your Ground Laws, and change.org followed suit with many petitions to dismantle these laws. According to the authors of the media mapping study, on April 17 ALEC terminated its controversial task force on those laws. The study’s findings show that all media sources, (traditional and digital) are roughly correlated (when one was covering the story, so were the others)—this extends to news articles, TV coverage, searches, petition signatures, and clicks to links (via bit.ly) on this coverage. The conversation on Twitter appeared to peter out after a while, and the authors speculate that this was either because campaigns had used Twitter early on or simply because social media may be quicker than other mediums to move away from one story to the next. Overall, however, the “tail” of news coverage went beyond actual reader engagement (sharing, clicking on links to articles, etc.) which the authors believe may indicate that readers simply lost interest even whilst the media continued coverage. 1. Broadcast media still matters. Broadcast media amplifies (spreads the story through coverage) and serves as a gatekeeper (what it chooses not to cover has a harder time getting out into the public debate, and how it frames what it does cover tends to stick). But activists who use other media channels and platforms (petitions, social media, blogging, leveraging like-minded organization and allies, personal networks) are now solidly influencing how the message is shaped and formed (framing). 2. Social change organizations can spin traditional media for their own purposes. Even though broadcast media still serve as strong gatekeepers to what does/doesn’t get covered and how it is framed, smart organizations leverage existing coverage to inform their supporters, piggyback off the coverage to mobilize their allies, and spin it (reframing) to meet their own messaging goals. And, from a messaging perspective, it’s promising, as evidenced by how successfully many Trayvon Martin proponents were able to shift the media narrative (the outcome of the trial is another matter). 3. The blogosphere covers issues long after broadcast media coverage peaks. Smart organizations know this, and court bloggers accordingly, understanding what motivates them to write and when. So understanding who is blogging (or has the potential to blog) about your issues and cultivating those relationships is key. 4. Contemporary news outlets today are increasingly more likely to get the maximum out their investment of time and journalists to cover a story. News outlets will cover a story even after readers have disengaged. Don’t get too excited. This has not been covered in a flattering light (see McJournalism). 5. Social media can create related micro-stories from broader events. These micro-stories then become news events in themselves and create a longer tail for the original story (the Million Hoodie March, for example). 6. Social media can side-step traditional media gatekeeping functions if you have good content. Some social media platforms that are particularly well-suited to a specific type of content (YouTube or Facebook for video-sharing, for example) quite powerfully and effectively side-step traditional media’s gatekeeper role, and thus are demonstrably able to shape public opinion. Organizations that know how to create relevant content for these and other platforms can get their message across in huge ways. 7. Social media is so much more than spreading the word. Because it is so heavily reliant on personal interpretation (one person sharing his or her opinion about a news event, in addition to simply sharing news of the event itself), social media is a powerful force in shaping the message and framing—and the public perception—about an event. 9. Use finding #8 (above) for good, and not for evil, okay? Hope you enjoyed this post. Mad props to the geniuses at the MIT Center for Civic Media for this incredibly data-rich study. Mindblowing stuff.